An orthodontist is a dental specialist who has successfully completed at least two academic years of continuous advanced studies in an orthodontic program of a dental school or institution approved by the American Dental Association. This advanced training includes such diverse studies as physics, embryology, genetics, human growth and development, biophysics and engineering. Only those dentists with this advanced education can announce that they are orthodontists. Why should I be concerned about my child's bite? A bad bite can be detrimental to the future of your child's mouth. Restoration, crowns or bridges are often impossible for a dentist to perform without prior repositioning of the teeth by an orthodontist. Properly aligned and supported teeth are healthier, easier to clean, and therefore more likely to last throughout a patient's lifetime. The AAO recommends that age seven is a good age for your child's first orthodontic examination. Conditions may be found that can be corrected at this early age by interceptive measures. This often will lessen or eliminate the need for help at an older age. That in turn can be a savings in the total cost of your child's orthodontic correction. Please don't wait until your child has lost all of his or her baby teeth. There are definite advantages to correcting many problems at an early age. Waiting until all baby teeth are lost can often complicate an otherwise fairly simple problem. Let your orthodontist decide the best time to intercept or correct your child's orthodontic problem. What part does heredity play? Heredity is a complicated combination of factors. Both parents may have perfectly aligned teeth, and the first child's teeth may erupt uneventfully. Then comes the second child and it is as if hereditary factors are working against each other. The child's teeth appear normal, but their alignment is going to cause problems in the future. So, assume neither the best nor the worst. Have your orthodontist evaluate your child's bite and proceed from there. Tooth movement is actually a normal response to light pressure. Pressure is applied by using a variety of orthodontic appliances, the most common being a brace or bracket attached to the teeth and connected by an archwire. Periodic changing of these archwires puts pressure on the teeth. At different stages of treatment your child may wear a headgear, elastics, a positioner or a retainer. Will my child look funny? Not necessarily. Minor corrections can be accomplised with braces completely concealed within the mouth. More involved treatment may require braces on the teeth to successfully move them to the desired potitions. Braces are the handles used to move your teeth in a positive manner. They vary from the conventional steel brackets cemented on the teeth to less obvious brackets bonded or cemented to the outer surfaces of the teeth. Plastic braces may be used for minor corrections. Ceramic brackets, which blend with the color of the teeth, are less obvious to the casual observer and offer the versatility of regular stainless steel braces. The latest ones are translucent enough to actually allow the natural shading of the teeth to show through. In all cases, regardless of the braces used on your child's teeth, the activating part of the braces is the wire that goes from tooth to tooth. 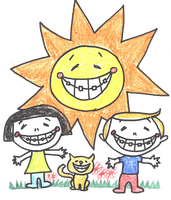 It is not uncommon to observe half of the children in a school with some sort of braces. Many kids consider braces cool. Discomfort has to result when we loosen a tooth for movement. This usually lasts about 48 to 72 hours and then the teeth are comfortable again. Each succeeding adjustment will mean some minor discomfort, although our patients report a lessening of the discomfort as the treatment progresses. We heartily encourage your child to pursue extra-curricular interests. Athletics can be a regular part of this routine. Speech may at first be somewhat affected, but only for a day or two. So we tell our patients that orthodontics is a normal part of this phase in their lives and that treatment should not preclude any activities they usually pursue within their school's programs. How often will my child need office visits? Appointments can be scheduled from two- to multiple- week intervals. Depending on the stage, the appointments are more frequent. Once the appliances (braces) are in place, appointments are scheduled at longer intervals. Every effort will be made to schedule appointments after school hours, but at times your child will have to come during school hours. School authorities are usually understanding. Orthodontic correction can vary from the comparatively simple closing of spaces in a few months, to the realignment of unsightly and disfiguring teeth. In the young child or the adolescent, treatment is as much a critical matter of timing and guidance as anything else. The usual treatment time varies from eighteen months to three years depending on the complexity of the problem. Most orthodontists agree that adult treatment will usually take from 10 to 20 percent longer due to the difference in the physiologic responses of the tissues in the mouth of an adult as compared with a ten or twelve-year-old. Simply put, an adult's bone structure is more dense and firmly set, so a slightly longer response time to tooth movement can be expected. The combined experience of orthodontists across the country points to a 95% permanent improvement rate. Teeth, like all parts of the body, are constantly changing and adapting. Where growth guidance is accomplished, the results are usually permanent. Jaw relationships affecting facial contours can be expected to remain for life. However, there are certain types of facial patterns that continue to change even past adolescence. (Should this be the case with your child, of course it will be discussed thoroughly so you are made aware of any detrimental growth indications.) Conscientious retainer wear following treatment will minimize minor movement or relapse. Will my dental insurance pay for it? Today many employers' dental policies include orthodontic benefits. For questions concerning eligibility, a pre-determination of available benefits can be requested from your insurance company representative. Some companies require submission of a diagnosis and treatment plan as well as a suggested payment schedule by the orthodontist before treatment begins. We will work with you and your insurance company. You should be aware that the insurance agreement is between you and your insurance company. It is your responsibility to see that your insurance company pays in a timely manner. Insurance quotes are NOT guarantee of payments. We provide you with the quotes your Insurance company gives us but cannot guarantee the payments. Insurance benefits for orthodontia is typically a per life time benefit. Your orthodontia benefit is per person per life time and is NOT renewable every year as in your general dental benefits. There is no age limit for orthodontics. Teeth and tissues are essentially the same in both adults and children. Orthodontists can successfully realign crooked teeth or a protruding overbite regardless of your age. Yes! Dramatic changes in a person's smile and profile can be achieved. A person can actually look years younger by straightening crooked teeth or correcting a overbite or an underbite. A beautiful smile can increase self-confidence and , in turn, a sense of well-being. Bad bites can be detrimental to a patient's health. Restorations, crowns or bridges are often impossible for a dentist to perform without prior repositioning of the teeth by an orthodontist. Properly aligned and supported teeth are healthier, easier to clean, and therefore more likely to last throughout a patient's lifetime. Not necesarily so. Minor corrections can be accomplised with braces completely concealed within the mouth. More involved treatment may require braces on the teeth to successfully move them to the desired positions. Braces are the handles used to move your teeth in a positive manner. They vary from the conventional steel brackets cemented on the teeth to less obvious brackets bonded or cemented to the outer surfaces of the teeth. Plastic braces may be used for minor corrections. Ceramic brackets, which are translucent, allow the natural color of the teeth to show and are much less obvious to the casual observer. They offer the versatility of regular stainless steel braces as well. Of course, in all cases, regardless of the braces used on your teeth, the activation part of your braces is the wire that goes from tooth to tooth. Why does my teeth look worse than before I started treatment? Occasionally we get patients who are alarmed at the changes they see in the mirror between orthodontic visits. We often caution that in some cases it may appear to "get worse before it gets better". Trust in the process is our best advice, patience is the key, drastic and rapid changes are not necessarily a good thing in teeth movement. Surgical intervention called ortho-gnathic surgery can offer dramatic results in certain cases where jaw relationships are so severely mal-aligned that tooth movement alone cannot accomplish desired changes. This treatment requires close cooperation between your orthodontist and the oral surgeon. If indicated this can be a viable alternative to conventional orthodontic treatment.